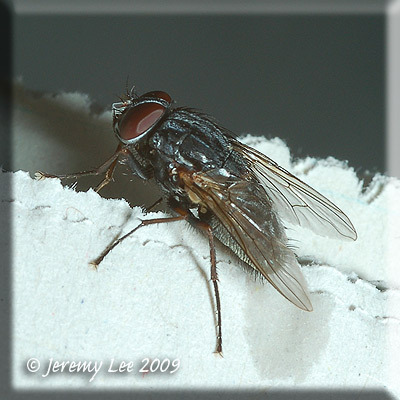 Muscina stabulans, more commonly known as the False Stable Fly, has partially reddish-brown legs, four characteristic dark stripes along the thorax region, and a pale spot above the thorax. These flies average 8 millimeters (0.3 inches) in length. The abdomen is either entirely black, or black with red sides. Its head ranges in color from a dark-grey to a whitish hue. M. stabulans are mostly found in rural and natural neighborhoods, and rarely inhabit cities. For the most part, they are active all year round, but activity tends to peak in the summer months, when the number of generation cycles also peak. Habitat is similar to that of the house fly, Musca domestica. M. stabulans have been spotted in animal housing, such as poultry houses, as well as in the mucosal linings of mammalian intestines. They can be found on carrion in the decomposition stages, but they exhibit a strong preference for the later stages of decomposition. They are able to reach a buried body in shallow ground through several inches of earth.